I have had some pending business with Bank of America that needed to be done at the branch where I actually have the account, which is Yuba City, so this morning after breakfast and after the fog had lifted sufficiently for me to feel safe doing so, I drove to Yuba City. I misread the local map and ended up spending 30 minutes wandering around Sacramento before I finally found my way back to I-80/I-5, but I had lots of time and all went well. Visibility was at least 1 km most of the way, which was fine. After dealing with the bank in Yuba City and getting lunch at Starbucks in Marysville, I returned to Sacramento via CA-70, having come up by CA-99 (and thus driving within a stone's throw of the house in which I lived from about 1971-78 with my grandparents in the town of Tudor). Having a fair bit of time on my hands, on a whim I detoured through East Nicholas and looked at where I once played Little League Baseball, including a stop at the school where my team once practiced under the tutelage of Wally Herger, who later went on to be the member of Congress from this district years later. 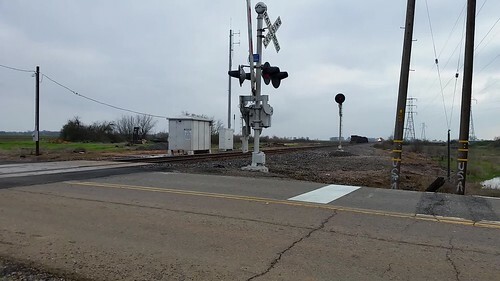 As I was returning to the freeway, I saw a headlight approaching at a railroad grade crossing and elected to stop for a video. This grade crossing is in Trowbridge, a "wide spot in the road" just east of East Nicholas. I then headed back to Sacramento to go see my sister. The good news is that she did not actually have the flu, although her lung problems had flared up badly. She was soundly asleep while I was there and I didn't want to disturb her, but I should be able to see her sometime tomorrow. I grabbed a small amount of food to take back to the hotel and returned there, where I sat back to take it relatively easy. Tomorrow I have a lot more driving to do. I will be passing through Marysville again tomorrow as I need to go see my mother in the Yuba County foothills, but I couldn't group errands because the bank isn't open on Sunday.